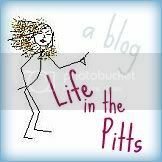 Life in the Pitts: Shhh! He's coming! If I can't catch up/read blogs WHILE having my morning coffee (because of some "task" or "important meeting") then my entire day is ruined. OH NO! I was really excited to read something funny and witty and maybe see another self portrait. Darn you, Helena's boss! Darn you!